Baker “gutted” to lose captaincy. Carl Baker has admitted he is “gutted” to lose the captain’s armband to new signing Reda Johnson. Johnson joined the club this month after he was released by Championship side Sheffield Wednesday and the Benin international was this morning appointed the new club captain. 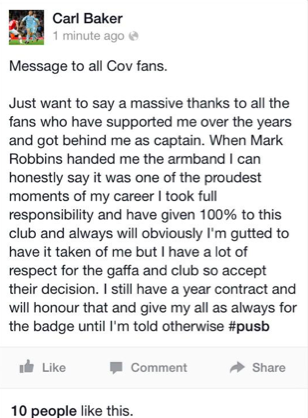 Baker took to Facebook earlier today to thank the Sky Blue Army for their support since he joined the club, and that although he is no longer the captain, he intends to remain at the club until at least the expiration of his contract next summer. “I spoke with Carl Baker last week about my intentions to change the captaincy and have decided after much deliberation to name Reda Johnson as club captain for next season. “There were obviously a number of candidates within the squad but I felt Reda had the necessary qualities to lead the side. « Adams “sad” to leave Coventry.